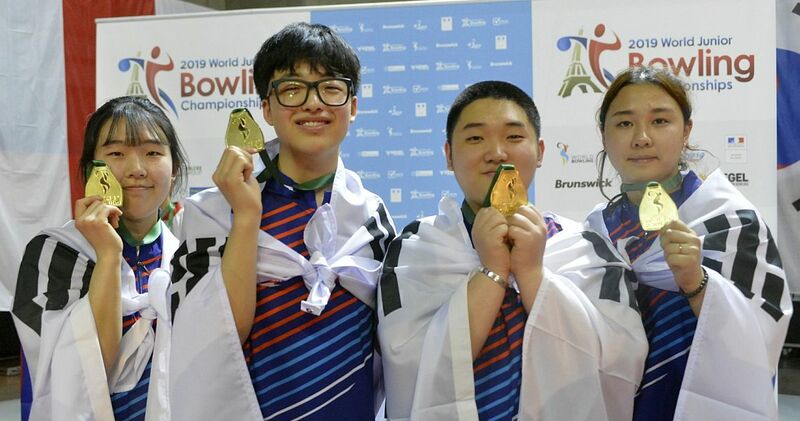 Finland’s Pyry Puharinen & Jesse Ahokas and Soree Hong & Jeong Youngseon of Korea earned the no. 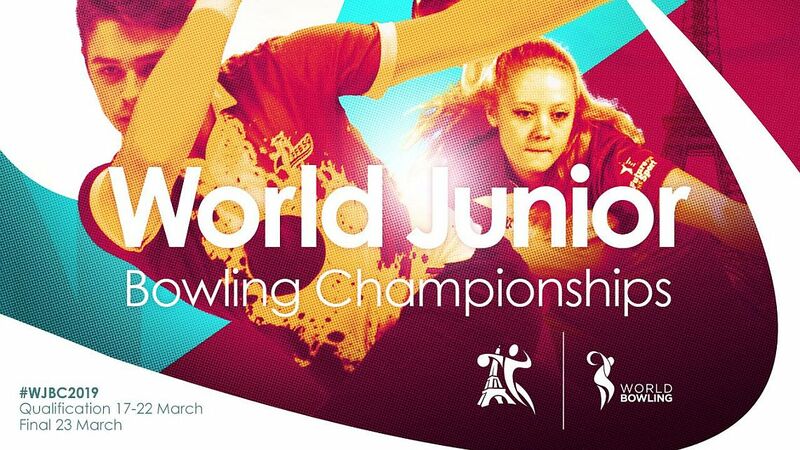 1 seeds for the semi-finals in the boys’ and girls’ doubles event of the inaugural World Junior Bowling Championships at Plaza Bowling Saint Maximin later this afternoon. The 2018 European Youth Champions, both 17-year-old two-handed right-handers averaged 238.08 over six games on the 41-foot Montreal oil pattern, using World Bowling’s unique Current Frame Scoring system to lead the field of 22 doubles with 2,857 total, including games of 413, 508, 458, 501, 488 and 489. Ahokas, who earned silver in singles, led all boys with 1,463, an average of 243.83, and singles bronze medalists Puharinen added 1,394. The last three games (1,478) and the total set new championship records for three and six games. 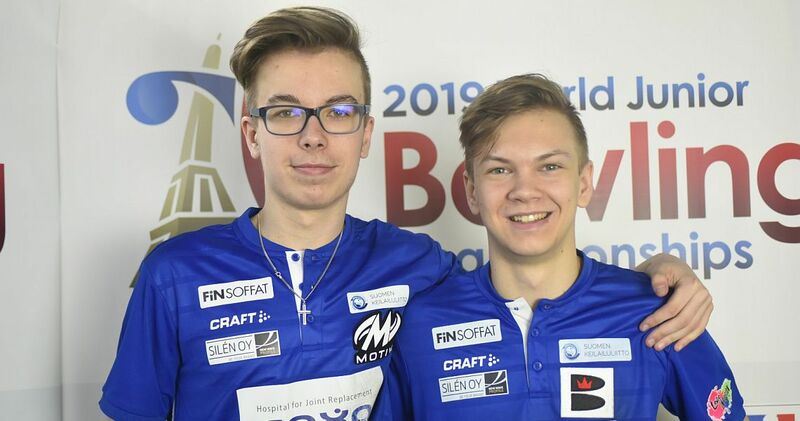 Trailing the Finns by 60 pins to earn the no. 2 seed were Paul-Sullivan Purps & Patrick Weichert of Germany, who toppled 2,797 pins (233.08 ave.), including 516 in game three, the highest team game of this Championships. 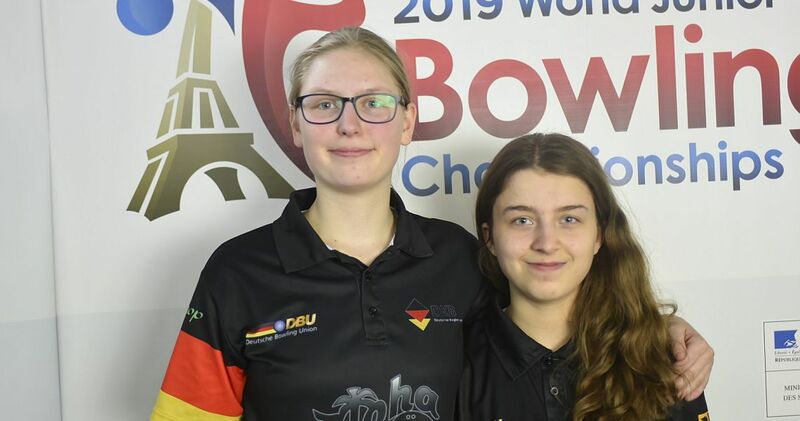 The Germans closed with a big 490 game to leap from fourth to second place and to avoid to bowl the Finns in the semi-finals. 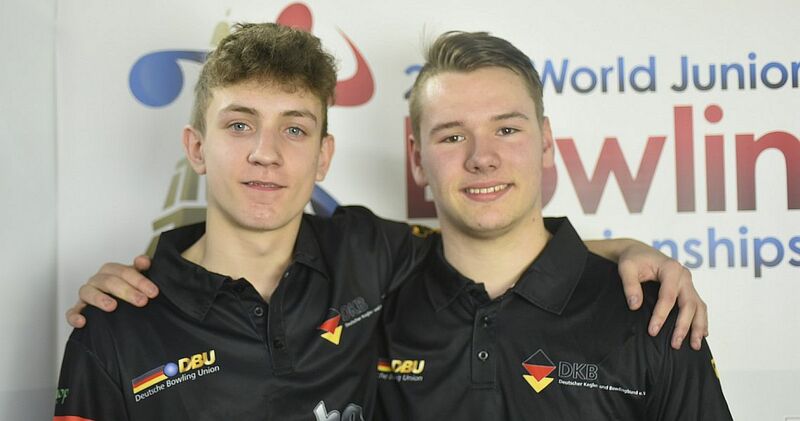 The Germans will meet overnight leaders Solomon Salama & Anthony Neuer from the United States at 17.00 CET this afternoon. 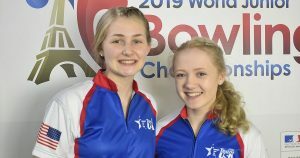 The Americans led squad A on Tuesday with 2,788 (232.33). 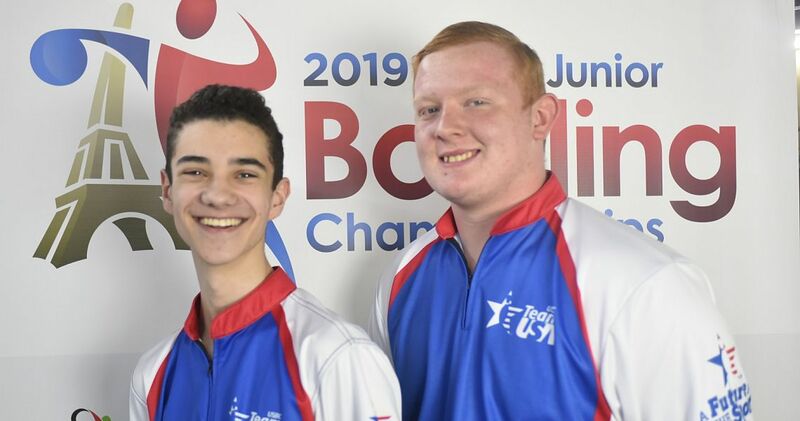 Anthony, the son of PBA champion Andy Neuer, rolled the highest individual game (288) and three-game series (768) of the doubles event. 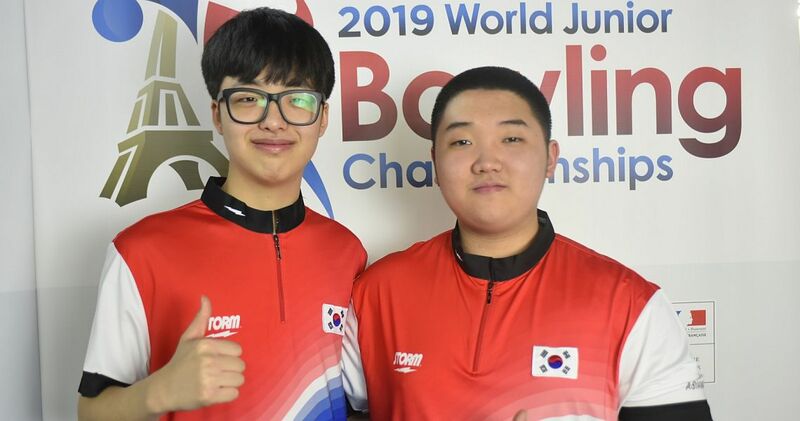 Korea’s singles champion and the first athlete to roll a 300 game at World Junior Bowling Championships, Ji Geun, and his team mate Park Donghyuk, round out the top 4 with 2,758 and will meet Finland in the semis. With 12 of 18 games in the books, Ji and Puharinen are deadlocked for first place in all-events at 2,915 and an average of 242.92. 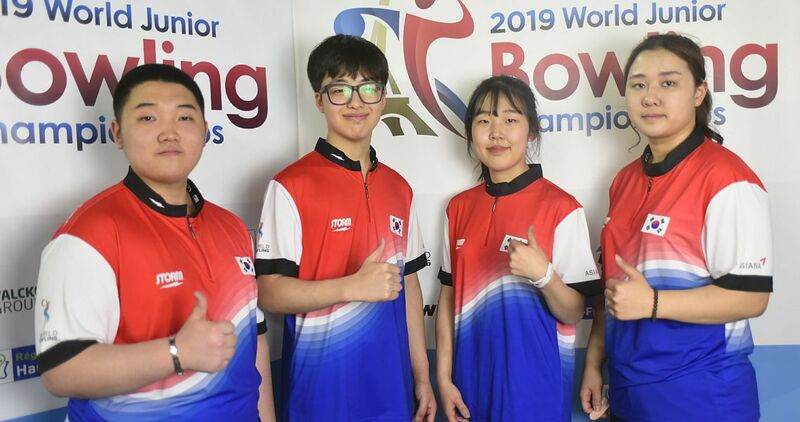 With six more games in the mixed team event to go, Ahokas sits in third place with 2,861, just 54 pins off the pace for the gold medal. Overnight leaders Soree Hong and Jeong Youngseon of Korea remained unchallenged to win the preliminaries and to secure the no. 1 seed for the finals with record 2,816 total and an average of 234.67. 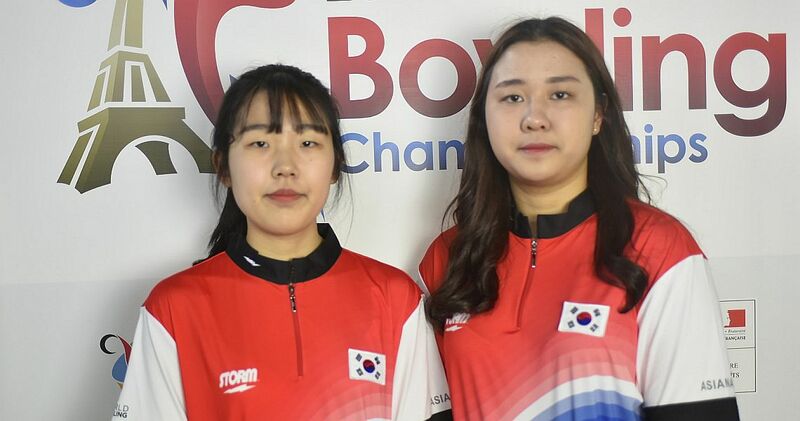 Soree led all girls with 1,455 and Jeong contributed 1,361. 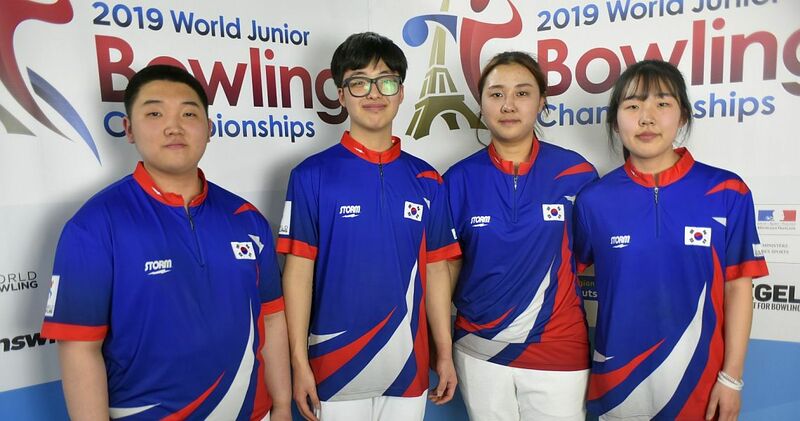 The Koreans were consistent during the preliminaries posting games of 477, 477, 462, 464, 446 and 490. Franziska Czech & Natalie Groll of Germany were the lone team of squad B, which survived the cut to the top 4. 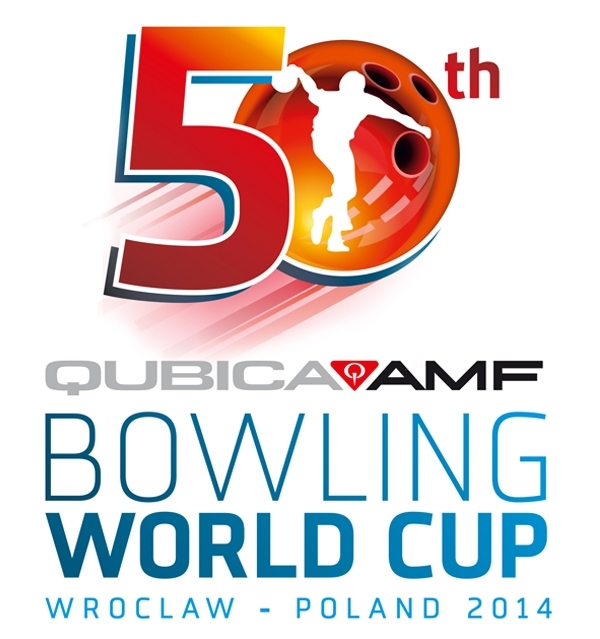 The Germans used six games between 492 and 424 to jump into second place with 2,704 (225.33). Germany will meet the girls from the United States in the semis this afternoon. 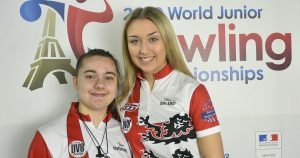 Kamerin Peters and Mabel Cummins finished third with 2639 (219.92), including the highest three-game series of 1467 (474, 484 and 509). 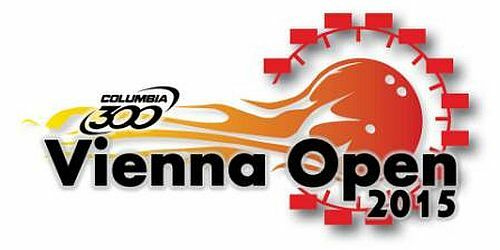 Peters posted the field-best 734 series and Cummins was just one pin behind with 733. 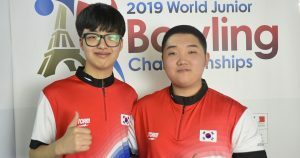 Korea, Germany and USA have both teams in the semi-finals. 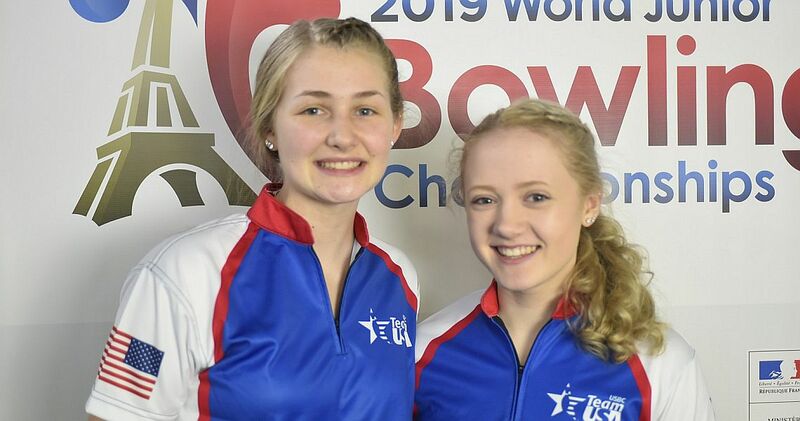 Isabel Allen & Rhian Dobinson, who were in third place after squad A yesterday, slipped only one spot to earn the fourth and final spot to advance with 2620 (218.33). The duo had a record 533 fourth game, including a 278 by Allen, the highest game of this Championships so far, and 255 by Dobinson. 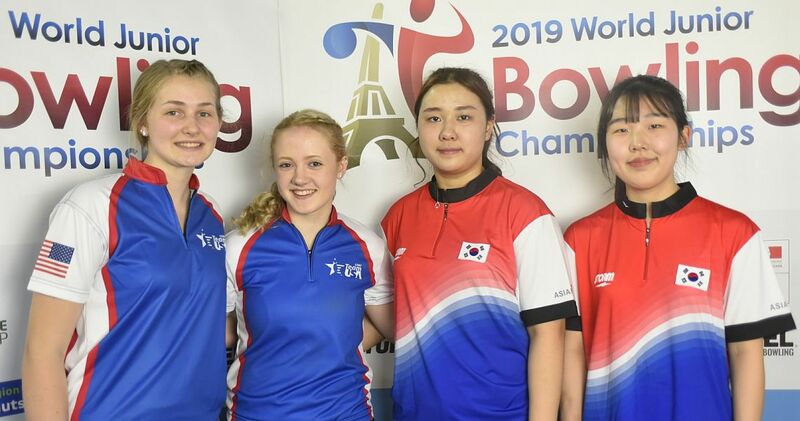 The English girls will take on the Koreans in the semi-finals. Hong leads the 47 girls in all-events after 12 of 18 games with 2,785 and an average of 232.08. Singles silver medalist Peppi Konsteri of Finland is 85 pins back in second place with 2,700. Singles champion Arianne Tay of Singapore sits in third place with 2,678. 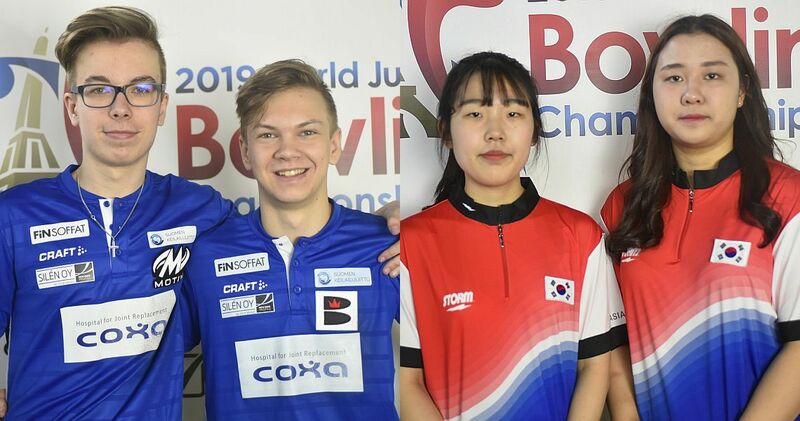 The first three-game block of the mixed team event will be held this afternoon starting at 13:30. 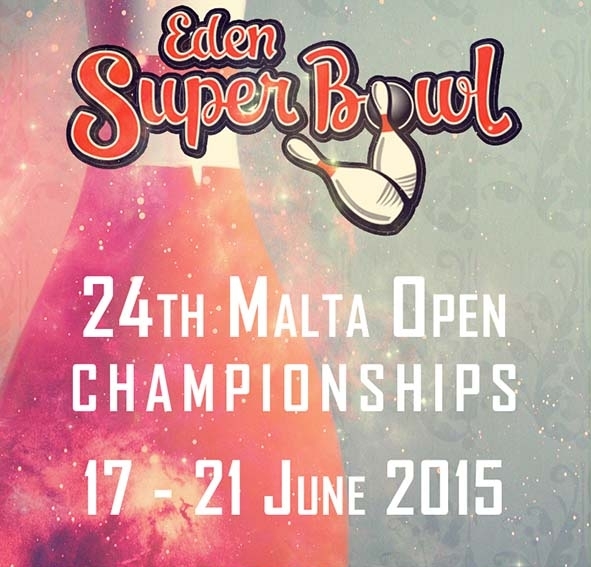 The third day of competition concludes with the boys’ and girls’ doubles semi-finals at 17:00.